James Samuel Tuck was the son of James Tock and Margaret Mowatt. James Tock was my great x 3 grandfather, born in Lincolnshire, England in 1818. He was married to Martha Wadd and they came to the Calais, Maine area around 1850 and had my great-great-grandmother, Emma Sophia Tock Shinn along with three other daughters. When Martha died in 1861, James was left with four small girls to raise in a foreign country, surely a difficult task. He married Margaret Mowatt, a New Brunswick native around 1865 and they lived in the St. Stephen and Milltown area of New Brunswick. When they married Margaret was already in her late 30s and was forty by the time she had James Samuel. When James Samuel was about seven, his father and half-sisters left for California in 1874. Story goes that James wanted a better life and wanted to go to California because of the better opportunities there. He asked his wife, Margaret, and when she refused, he took his girls and left without her and little James Samuel. 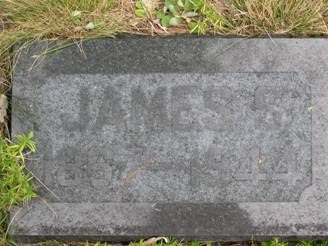 James Tock died in 1891 and to this day I have no idea if her kept in touch with his "second family" back in New Brunswick. James Samuel had a paper with the names and addresses of his half-sisters in California, but I do not know if they kept in touch. Margaret Mowatt died in 1889, she never remarried and was devoted to her son (as he was to her). He married Isabel Maude Mersereau in 1890 and they had seven children. 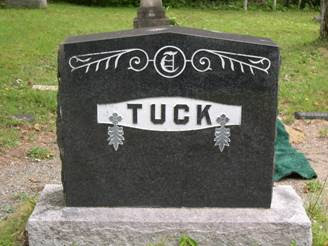 James Samuel Tuck is buried in St. Stephen Rural Cemetery, Charlotte, New Brunswick along with his mother and several of his descendants. I always had a hard time finding James Samuel because all I knew was his name and an approximate birth date. I hunted for him in both New Brunswick and Maine but had no luck until I stumbled across a James Tuck in a census return. From there I was intrigued and eventually made contact with a descendant of James Samuel's which cemented his parentage. While I had known nothing about James Samuel, my "cousin" knew nothing about James Tock. Apparently James' leaving his second family was a hard blow to them because they never spoke of James and there were some bitter feelings towards what he did (probably the reason for the name change from Tock to Tuck). 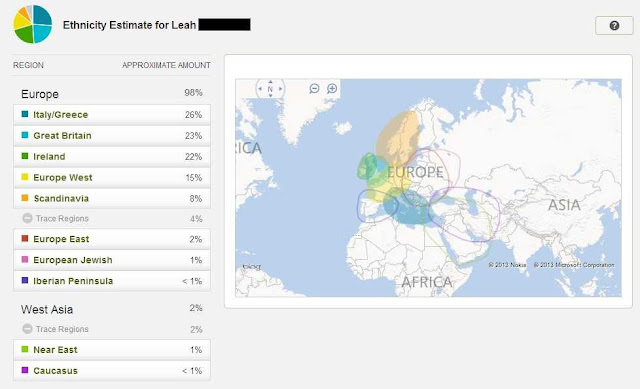 As sad as his leaving is, I'm certainly glad he did otherwise my great-great-grandmother probably never would have met and married Heman Doyle Shinn and had my great-grandfather, Elmer John. Saturday Night Fun: "You Might Be a ..."